Happy Monday and welcome to the start of another great week with #ThatBusinessShow! Remember that you can catch the show every weekday at 8am on #1250WHNZ and http://www.tampabayradio.com! If you wanted to come on the show, head to http://www.tampabayradio.com and fill out the contact form and we can maybe get you on the #MorningAir! Bringing on talent, professionalism and passion on the air, our Host, Jamie Meloni welcomed Alex Harris and Tara Isaac on #ThatBusinessShow this morning! Alex Harris is known as a soul, R&B singer, actor, philanthropist, and entrepreneur who cites Marvin Gaye, James Brown, Al Green, and Otis Redding as his major influences. Tara Isaac joined Feather Sound Country Club in July, engaging her strengths as a business leader immediately. She directs, manages, and evaluates all club programs from an operational and strategic perspective. If you missed today’s episode of #ThatBusinessShow on #1250WHNZ at 8am, then head tohttp://www.tampabayradio.com or Jamie’s YouTube channel athttp://www.youtube.com/jamiemeloni to listen to any show on demand! 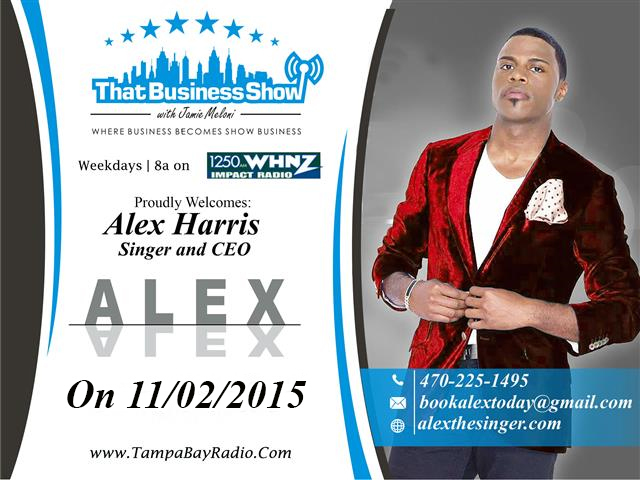 Coming on first on the show, Alex Harris was interviewed first on #ThatBusinessShow! Alex Harris is known as a soul, R&B singer, actor, philanthropist, and entrepreneur who cites Marvin Gaye, James Brown, Al Green, and Otis Redding as his major influences. At the ripe age of twelve he went on tour with his band A7, comprised of himself and five of his brothers, launching his career. Since then, he has had billboard hits, traveled the world, and created his Arts Conservatory for Teens (ACT). Performing at venues such as presidential inaugurations of both Bush’s, and President Obama’s inauguration as well! Helping Teens reach their talent potential, the Arts Conservatory for Teens gives young people the opportunity to develop their skills and learn essential information for adult development! For more information, head to http://www.alexthesinger.com and http://www.artstampabay.com/org/detail/220211399/Arts_Conservatory_for_Teens for more information on The Arts Conservatory for Teens! Our second guest on #ThatBusinessShow was Tara Isaac, Operations Director with Feather Sound Country Club! Tara Isaac joined Feather Sound Country Club in July, engaging her strengths as a business leader immediately. She directs, manages, and evaluates all club programs from an operational and strategic perspective. Her strong commitment to the mission and values of FSCC ensures a cohesive working team, service developments, and continued improvement. Discussing the different membership options, advantage programs, and engagement oppourtunities, Tara was on the #MorningAir with Jamie Meloni this morning at 8am! This entry was posted in Articles, Entrepreneurship and Business and tagged articles, blog, business, interview, live, radio, talk, word, work. Bookmark the permalink.